As science and medicine are developing, we are seeing how a holistic approach is necessary to ensure the whole body stays healthy. If one area is challenged or comes under attack, the side effects can be seen throughout the body. This is particularly true when looking at oral health and there are a surprising number of ailments that can be prevented or eased, with good oral care. Aesthetic dentistry will not only improve your social life, but it can keep your health in check too. Before looking at the side effects, it is important to note that one can have poor oral hygiene despite brushing every day. If one suffers from physiological issues such as misaligned teeth, especially when teeth are crowded, simply brushing will not be sufficient to clean plaque away. Overlapped teeth often cause nooks and crannies that are inaccessible with a toothbrush, or even the dental hygienist’s tools. This can lead to plaque build-up, providing a breeding ground for bacteria, leading to infection and inflammation. At this point, the below issues can become real risks. Countless studies have found that the mouth is one of the dirtiest parts of the human body. The moist, warm and dark conditions create an ideal breeding ground for bacteria. While we now know that certain bacteria are necessary for the body to function correctly; we need to ensure the bad bacteria are kept under control. Medicine has recently been finding more and more links between poor oral care and poor health. Once infection and inflammation set in in the mouth, the risk of bacteria entering the bloodstream is real. Although these insights could lead to answers for curing disease, the data shows how risky forgetting to brush can really be. Gum disease and inflammation in the gums can lead to systemic inflammation and infection, a concept that is now widely accepted, but that was reiterated recently by doctors at Idaho State University. Any system that is fighting infection will be at risk for various resultant ailments; however patients with autoimmune disease and compromised immune systems are particularly at risk. Oral infection and gingivitis can lead to bleeding gums or ulcers providing a conduit for bacteria to enter the bloodstream, ending up in the heart. Bacteria that find their way into the tissue lining the heart can cause pockets of infection, which lead to endocarditis. Also, research shows that high levels of bacteria in the bloodstream can lead to narrowing of the arteries and blood clots, causing a stroke. Finally, a study published in the Harvard Heart Letter showed that plaque that is found in arteries in the heart has been found to have the same species of bacteria in it as that found in periodontitis. This plaque causes a strain on heart muscles and could ultimately lead to a heart attack. Medical science is still researching whether poor oral care is a cause for Rheumatoid Arthritis (RA), though many believe this to be the case. However scientific studies have shown that periodontal disease can worsen the symptoms experienced by the patients already suffering from this auto-immune disease. Diabetics are likely to experience higher incidences of periodontal disease, however, The American Diabetes Association has recently iterated that it works the other way around as well. Periodontal disease leads to an increase in sugar levels in the body. This increase leads to potential issues for diabetics, as their systems have to deal with these increased sugars. Sugars in plaque can also be ingested by bacteria when gum disease is present, which exacerbates problems diabetics have in metabolising these sugars. While science hasn’t confirmed gum disease or poor oral care will lead to lung disease, as with RA, patients already suffering from pulmonary disease can find their symptoms exacerbated as found in a study by the American Periodontal Association. This is true for Pneumonia and Bronchitis as well as Lung Cancer where the patient’s immune system is compromised and cannot fight the added challenges of a systemic bacterial attack. In a recent study at the University of South Hampton, patients were asked to perform a series of tests challenging memory and information retention. Patients suffering from Gingivitis performed more poorly compared to those who had healthier mouths. Women who didn’t brush regularly were 655 more likely to develop dementia and a different study found a link between Alzheimer’s and tooth loss. Patients with fewer teeth were more likely to develop Alzheimer’s. Pregnant women are high risk generally and as a result, have to pay special attention to their oral hygiene. Not only does pregnancy provide limitations for treatment due to the chemicals and anaesthetics involved but also an infection in the mother’s body can threaten the health of the foetus. Medical studies at University of Pennsylvania School of Dental Medicine show this leading to potential complications and preterm birth. Oral care can help to protect kidneys and prevent kidney failure. A study by the University of Birmingham in the UK and published in the Journal of Clinical Periodontology, showed that patients with periodontal disease were far more likely to experience renal inefficiency, which leads to the gradual breakdown in kidney function and finally, renal failure which is potentially life-threatening. While migraines are most commonly linked to physical issues in the mouth and jaw like Malocclusion or teeth grinding, there have also been cases linked to poor oral hygiene. Plaque and bacteria build-up in the mouth can lead to a breakdown of the enamel of the tooth, and cavities. When a cavity is deep and exposes the nerve, everyday actions like eating and drinking can trigger painful reactions. If the nerves are compromised, the message could be sent to nerves in different parts of the head leading to severe headaches or migraines, according to the University Of Southern California School Of Dentistry. In some cases removing the tooth will become necessary to heal the infection and cure the migraines; however dental implants can effectively replace your tooth and restore your smile. 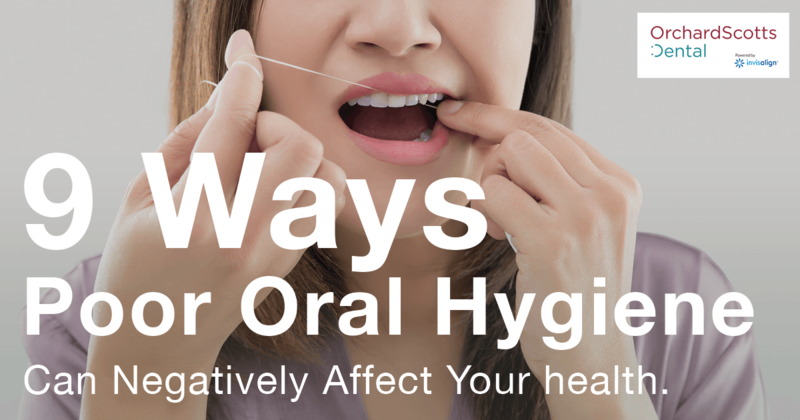 Though the above list paints a fairly bleak picture regarding oral hygiene and its effect on various systems within the body, avoiding these issues is a fairly straightforward process. Firstly it is important to establish if you have any issues regarding alignment, crowding or any other arrangement issues that could lead to unreachable areas in the mouth. A consultation with one of Orchard Scott’s Dentists will establish problem areas and solve your alignment problems with traditional braces or with the more modern Invisalign system. Once your smile makeover has been completed, avoiding the above threats is as simple as following your standard oral care plan. Avoid smoking or tobacco products that can not only stain teeth but can also cause oral throat and lung cancer. Finally be sure to book annual check-ups with your dentist or oral hygienist. If you’re unsure of any issues you may be experiencing, one quick trip to the dental clinic in Singapore could save thousands in medical bills and potentially, your life.